Mommy's Favorite Things: Our Must Haves for Potty Training #PampersEasyUps and a GIVEAWAY! 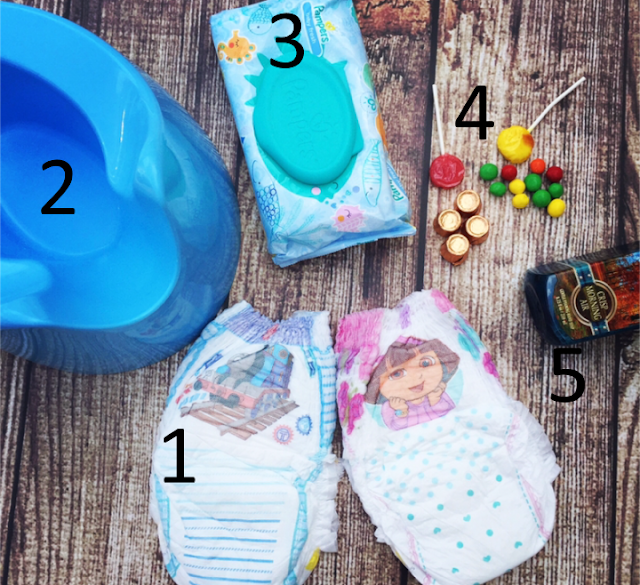 Our Must Haves for Potty Training #PampersEasyUps and a GIVEAWAY! I was compensated to write this post. All opinions are 100% my own. We're at that stage again, for the 3rd time in my mothering career. That stage is Potty Training! I've been pretty lucky in that my older 2 trained VERY quickly, as we waited until they were fully ready. And even though the baby (he'll always be my last, my baby) is 2 years and 8 months and showing full signs of readiness, he is my latest and hardest to train. We've been thankful for #PampersEasyUps which help us avoid accidents at home and away but still allow Liam to feel like he's wearing underwear and not a diaper. Pampers Easy Ups have a full 360° stretchy waistband, and a super soft cottony feel, which makes them feel like real underwear! But the extra absorb channels and dual leak-guard barriers, make them more like a regular diaper. So you get the best of both worlds when trying to potty train your littles! The Thomas the Engine™ and Dora the Explorer™ designs on Easy Ups help make potty training fun for both boys and girls. Also, Easy Ups is now rolling out new Hello Kitty™ designs. Plus check out that leak-guard barrier!! Not much is getting through that! -1, Of course is Pampers Easy Ups, we love the features they offer and they come in a variety of sizes (2T-3T, 3T-4T, 4T-5T) and are available in stores nationwide. They are a must for going out and not prolonging the process by putting your child in diapers. -2 A little potty makes potty training much easier. I leave mine in my living area so the child is around it all of their waking hours and can easily be reminded to use the potty. This has really helped all my kids grasp the concept a lot faster. -5 Lastly is #5, but probably the most important. That is, hand soap!! VERY important for these training littles. We also keep hand sanitizer around as well. The NEWLY redesigned Pampers Easy Ups are amazing! We've been using them for out and about and naptime and they are great. When he starts to go in them he tells me right away (it doesn't feel like a diaper, it feels cooler to the touch) and this is the perfect way to get him to use the potty more regularly. We've been potty training for a little over a week now and during the day I'd say we're a good 80% accident free, so I'm thankful for yet another great potty learner and also for Pampers Easy Ups for catching some of those 'accidents' for me! You can get a $2 coupon here off the new Pampers Easy Ups! Not only are Pampers Easy Ups awesome BUT you're going to get a chance to try them for yourself!! SAY WHAT?!?! 1 reader is going to win a $50 AMEX Card, Pampers Easy Ups, and a copy of Ilana Wile's book, "The Mommy Shorts Guide to Remarkably Average Parenting"
I am not potty training right now, but it is not fun! It is a lot of hard work and mishaps. We're overnight potty training my youngest grandson. Not so much a blast when you have to keep washing bed sheets! I am not potty training, but my niece is with her daughter. We are not potty training now. Nope, we are not potty training, thankfully! My best tip is to wait until your child is ready. No we are not potty training right now but will be before long and I have potty trained several before! I will be potty training my grandson when I babysit for him in Nov. I am not potty training right now but I will be helping to potty train my niece in a year. We have been done with potty training quite awhile ago. Yes it takes lots of patience! Yes, we have just started potty training our 2 year old and we need all the help we can get! I am potty training right now, have done it and it takes patience. I have potty trained my own 4 kids and now I am potty training my 2 granddaughters that I keep during the day who are both 2. No I am not potty training right now, I hear it is frustrating! I just finished potty training my son. Thankfully he is 100 trained day and night. :) Now we are starting to potty train my nephew, hopefully he will be easier than my son. I am potty training and let me just say this,its an absolute nightmare! I am not potty training right now. And no, it isn't a blast at all for me. Two of my grandkids are training right now. It proves that every kid is different because one is doing great and one is struggling. I think its exciting, yes. I'm not currently potty training, but have a family member who is getting ready to start! No I am not potty training. Potty training a boy is no joke! My youngest grandson is almost at the age of potty training. I think it is more of a challange then a blast. I am not potty training right now, however I have a relative who is and who is reliving all the joys I had potty training my two children and helping my son potty train his two boys. I AM JUST STARTING TO POTTY TRAIN MY DAUGHTER :) HOPEFULLY, IT GOES MUCH BETTER THAN IT DID WITH MY SON LOL ! My nephew has started potty training. We just bought him a special light for the toilet to illuminate it with pretty colors. No we are beyond potty training. Both of my children were trained pretty quickly. No, not at the moment but I will in the next six months. I would not call it a blast lol but I've been lucky enough that the others went very smoothly. I am potty training my 2 year old son and it is going pretty good for now! !